December 10, 2012, Pittsburgh, PA – Graduating high school seniors in western Pennsylvania are invited to enter the 7th Annual "Words to be Heard" Scholarship Contest, sponsored by Edgar Snyder & Associates. The law firm, which helps people who injured in accidents, is asking students to create programs that will discourage their peers from underage drinking, drunk driving or texting while driving. Students can submit entries using their preference of creative options, including videos, PowerPoint presentations, brochures, websites, essays, or another original approach. A panel of outside judges will review the entries and will award one grand prize scholarship of $5,000, three second place scholarships of $2,500, and three runners-up scholarships of $1,000 to be used toward the students' continuing education. "At our law firm, we help the victims of accidents caused by drunk driving and texting while driving," said Attorney Edgar Snyder. "We designed the scholarship contest so teens would think about how they can influence their peers to prevent tragedies. It's a way to raise community support and awareness, while offering students a chance to earn a college scholarship." Since the scholarship contest began in 2007, Edgar Snyder & Associates has awarded 56 scholarships totaling $70,500. Students entering the contest must be high school seniors who plan to attend a four-year college, university, or trade school in the Summer or Fall of 2013. All entries must be postmarked on or before March 29, 2013 to be eligible. 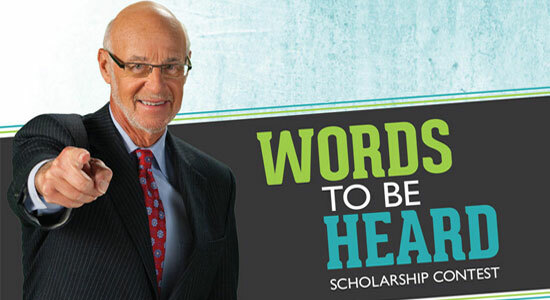 To view the official rules or to request more information, visit the "Words to Be Heard" scholarship contest section on the Edgar Snyder & Associates website or call Edgar Snyder & Associates at 1-800-394-3660 ext. 4412.